Alan's career as a wildlife artist commenced in 1984 when he was commissioned to produce wildlife paintings for a calendar. Alan Ainslie has had several solo exhibitions and has participated in numerous international wildlife exhibitions where his paintings were exhibited with the works of world-renowned artists such as Raymond Harris-Ching (New Zealand), Keith Joubert (South Africa), Kim Donaldson (South Africa), and Paul Bosman (USA). His first solo exhibition in 1987 was opened by well-known South African conservationist Clive Walker. Alan Ainslie has completed numerous major commissions, including a life-size bronze sculpture of two gemsbok (oryx) for the Kgalagadi Transfrontier Park between South Africa and Botswana. Other commissions include buffalo as well as wild dog bronzes for the players who participated in the 1998 One Million Dollar and 2000 Two Million Dollar Golf Challenges at Sun City. Today the artist's paintings, drawings and sculptures grace the homes of art collectors worldwide - France, Germany, Italy, Australia, Saudi Arabia, Hawaii, United Kingdom, United States of America, Taiwan, Namibia and South Africa. Committed to the conservation of wildlife in South Africa and elsewhere in the world, Alan Ainslie has donated part of the proceeds from his work to various wildlife organisations such as the Rhino & Elephant Foundation, Endangered Wildlife Trust, World Wide Fund for Nature and the Wildlife Group of the South African Veterinary Association. 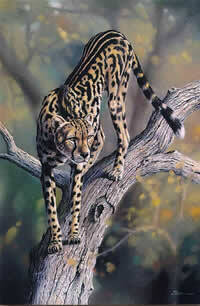 In addition to his wildlife art, Alan Ainslie is also a successful graphic designer and illustrator. He has illustrated numerous stamp series, miniature sheets and first-day covers for India, Singapore, Hong Kong, Canada, Namibia and South Africa. His stamp designs not only cover wildlife, but also portraits of international figures such as Mahatma Gandhi and Nobel laureates including Nelson Mandela, Nadine Gordimer, Albert Luthuli and Desmond Tutu. In addition subjects that the artist has illustrated for stamps emcompass architecture, culture, transport and tourism. In 1996 Ainslie was commissioned by the South African government to create the inside front cover and watermark design for the country's new passport.